In existing literature on the War on Terror, the role of the news media has received ample attention. Especially considering the controversy surrounding the Iraq War, the way that the mainstream news media framed the war has been extensively scrutinized in academics. These studies have primarily focused on the way these news frames influenced the American public perception of the War on Terror. Among communication scientists, there is a broad consensus that the way news organizations cover important issues in their outlets has a profound effect on how the public understands these issues. Whereas a number of frames have been studied extensively, the role of nationalism has remained fairly overlooked. An examination of the use of the nationalism frame by news outlets therefore is a valuable addition to existing literature. It provides an insight into the potential impact this frame had on the American public in the context of the War on Terror. In this study, three newspapers were compared in terms of the extent to which they used the nationalism frame in their news coverage during the War on Terror. These newspapers were The New York Times, the New York Post, and the Saint Louis Post- Dispatch. More specifically, the extent to which these newspapers adopted nationalist statements from President George W. Bush’s speeches was measured by conducting a quantitative content analysis of these newspapers. There is consensus among scholars that during the War on Terror, the press depended too much on information presented to them by government officials. The news media have been blamed for abandoning their role as watchdog of the government during the War on Terror. 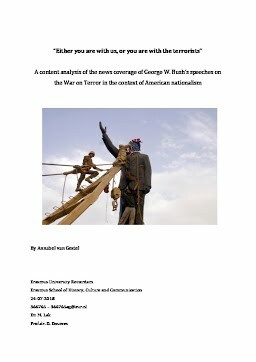 It is argued in this study that nationalism played a big role in the news framing of the Iraq War in the media. To measure nationalism in the newspapers, three concrete characteristics of American nationalism were identified on the basis of existing literature. These were exceptionalism, vindicationism, and othering. It was concluded that all three elements were adopted to a much higher extent by the conservative newspaper, the New York Post, than by the other two newspapers that are generally perceived as liberal. Besides, it was found that the nationalism frame was much more pervasive during the Iraq War, than during the Afghanistan War. All in all, readers of the conservative newspaper were significantly more likely to be influenced by nationalist sentiments in their perception of the War on Terror than readers of the liberal newspapers.